The Lucas Fiorella Friendship Bench is pleased to announce a partnership with the Ontario College Student Alliance (CSA) to promote improved mental health among Ontario’s college students. 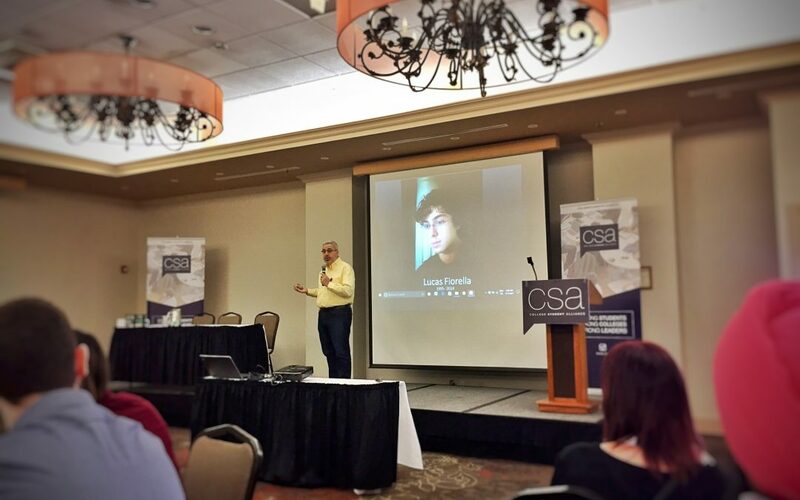 The CSA is a non-profit, non-partisan organization that works collaboratively with post-secondary education stakeholders & government to improve the college experience. Members of the CSA include leading colleges across the Province of Ontario, such as: Niagara College; Northern College – Haileybury, Kirlikland Lake, and Timmins campuses; Sault College; St. Lawrence College – Brockville; St. Clair College – Windsor; Georgian College – Owen Sound and Orillia campuses; Fleming College – Peterborough; Cambrian College; Centennial College; Confederation College; and St. Clair College – Chatham. Through its advocacy, education, and research, the CSA has a long history of advocating for college students in partnership with student leaders, and so we believe this organization’s goals and advocacy aligns perfectly with our #YellowIsForHello campaign. The CSA – #YellowIsForHello partnership was launched at CSA’s annual member conference in Kanata, Ontario. Friendship Bench co-founder Sam Fiorella spoke to 60 student leaders from across Ontario’s Colleges about the growing issues students face with mental illness, and how we can work together to connect more students to available on-campus support services, with the goal of decreasing the number of attempted and completed suicides in Ontario. The #YellowIsForHello campaign, which encourages peer-to-peer mental health conversations among students, will be adopted by the CSA and promoted throughout member and non-members schools across Ontario. We look forward to this partnership and to working more closely with student leaders from member schools. We believe that together, we will have a positive effect on the mental well-being of Ontario’s students. Stay tuned for more news from The Lucas Fiorella Friendship Bench, #yellowisforhello, and the Ontario College Student Alliance partnership. We’ll share joint efforts and campaigns with you right here on this blog.